Armagh Theatre’s Group is Coming Home | SCENE! 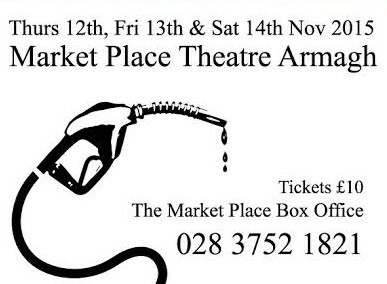 One of Northern Ireland’s leading amateur theatre companies, the Armagh Theatre Group, are returning to The Market Place Theatre in Armagh with Joseph O’Connor’s debut stage play, Red Roses & Petrol. First performed in Dublin by The Pig’s Back Theatre Company in 1995, Red Roses & Petrol follows Moya Doyle as the newly minted Dublin widow prepares for the funeral mass of her husband Enda. She is waiting for her children to make it home for their diaspora, returning to their homeland from America and England for this sombre occasion. The problem is that ghosts from the Doyle family’s past are making a visit as well, and the consequences will be both profoundly disturbing and memorably comic. Red Roses & Petrol won the In Dublin Magazine Award for best new play, and has been performed in Dublin, London, and New York. It was also a film starring Malcolm McDowell. And now Armagh’s own Theatre Company are heading to The Market Place Theatre for their performance of the play. Red Roses & Petrol will be staged from Thursday 12th to Saturday 14th November at 8pm each evening. Tickets are priced £10 and £8 (concession) and can be booked at The Market Place Theatre website.